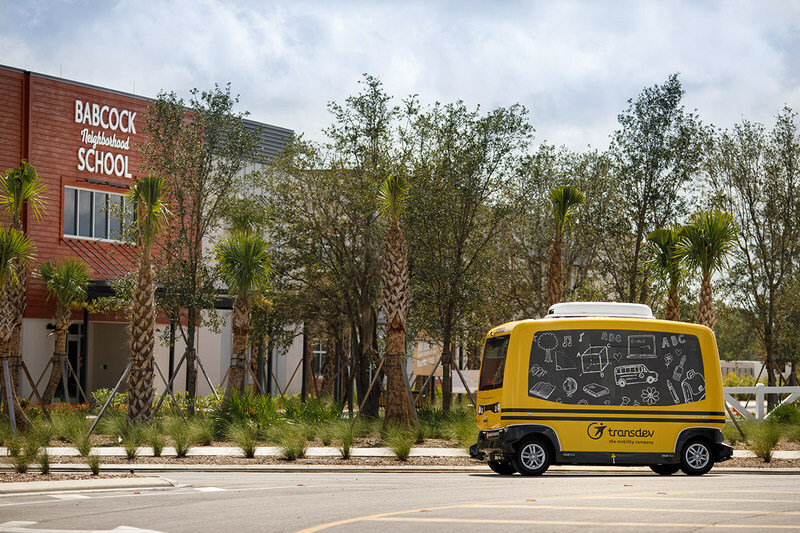 Babcock Ranch, FL will run the world’s first on-road tests of an autonomous school shuttle from Transdev this fall, according to a release from the company. The yellow shuttle will transport up to 12 children and will operate from a designated pick-up spot on a pre-set route with a safety attendant on board. The shuttle, known as the EasyMile Easy10 Gen II, runs on electricity and tops out at 12 mph, but can eventually go up to 30 mph with necessary infrastructure. Eventually, Transdev hopes to build out a door-to-door, on-demand service operated through a smartphone app, which would be open to any students within the Babcock Ranch community going to Babcock Neighborhood School. Cities have increasingly looked to autonomous shuttles to supplement transit service, as they are capable of carrying plenty of people on pre-determined routes and at slow speeds. Austin, TX, Houston, Detroit and Las Vegas are among the cities that have started publicly testing shuttles — often in busy downtown areas — to move people between established transit stops and popular destinations. School buses may seem like a natural next step since they travel familiar routes and end at a single destination, but carry obvious safety concerns given the passengers. TransDev notes the slow initial speed and the fact that the shuttle will have automatic braking that can react 30 times faster than a human driver. Eventually a safety upgrade will allow the shuttle to navigate around unexpected obstacles. The presence of a safety attendant will also ease some concerns, as well as act as a source to answer children’s questions about the shuttle. The shuttle pilot also fits in with the sustainability vision of Babcock Ranch, located northeast of Fort Myers. The planned community bills itself as the first solar-powered community and says it hopes to build out autonomous technology for grocery and package delivery and transportation for residents, of which door-to-door school bus service will be a key part.